I don't...exactly...remember how to BREATHE!...and I really haven't been able to since I found out that this book will exist as of next year. Ugh! Next YEAR!! Are you kidding me!? Part of me wishes that I didn't find out about it so soon. Just yet ANOTHER reason why the world CAN'T end on December 21st-I won't LET it!! I kid you NOT, I visit this book's Goodreads page at least twice a week..just to stare at it..somehow WILL it to be June 18, 2013...right..NOW. Doesn't work. But you better believe that I'll keep trying. I could go on for a few paragraphs. I really and truly can. But I won't. Just know, my dear readers (if you don't already), that Neil Gaiman is pretty much my entire reason for reading. Or at least, he became that reason after I read my very first book by him, Neverwhere. If you haven't read that book...I'm not exactly sure why you're still here reading this..go READ IT!!! You will NOT regret it..I GUARANTEE it!! Okay..I'm calm..I swear. Are YOU a Neil Gaiman Fan? This giveaway is pretty much a must right now. I lay in bed last night thinking about how much I need the entire WORLD to know how amazing this author is, if you don't already know. 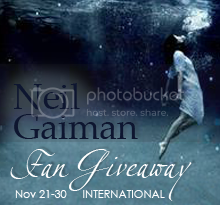 So here's the plan: This giveaway will be for both new and long-time Gaiman fans. I'm offering you a choice of 1 of 2 books. For those new to him, I'm offering my favourite, Neverwhere. 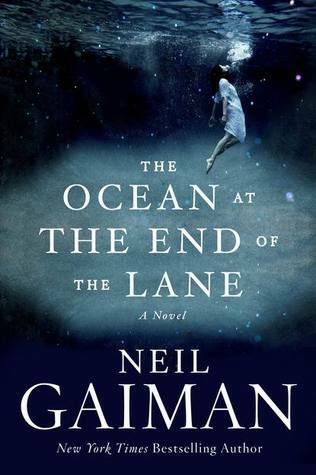 For long-time fans, I'm offering a pre-order of The Ocean at the End of the Lane (Released June 18/2013). OR, whichever one you want! Either way..you're reading a Gaiman book, and that makes me a HAPPY Reeka. 2. Open INTERNATIONALLY as long as The Book Depository ships to your country (check). 3. Choose either Neverwhere or The Ocean at the End of the Lane (this won't be shipped until the release date of June 18/2013). 4. Must be 16 years or older to enter. 5. Contest ends on November 30, 2012 at 12:00AM. 6. Winner will be announced via Twitter and/or email and will have 48 hours to respond. So be sure to follow! Add this button to your sidebar for more entries! Oh my goodness, you and me BOTH. They're quite pricey though =(. Thanks for entering and stopping by! That's what I love so much about him. He appeals to ALL ages *happy sigh*. Thank you for entering! The only book Ive read by Neil Gaiman is Coraline, though Im extremely interested to try Nevermore! Thanks! I'm excited for you to read it! Good luck and thank you for entering! The Ocean at the End of the Lane pleaseee! thank you! Definitely =). I will ordering one for myself as well lol. Thank you for entering and passing by! Hi Lucinda! Thank you so much for stopping by and actually reading my super fan girl post lol. Good luck! Awww, I'm so glad to hear that =). Best of luck and thank you for entering! Amazing! LOVE Neil Gaiman and both of these are on my TBR :) Thanks for the chance! YES! Neil Gaiman love! You're very welcome, good luck! I'm a new Neil Gaiman fan, but I'm so excited to start reading his books! AHHH! Then I am SUPER excited that you entered this giveaway. You should definitely check him out either way. Good luck! I'm a fan of Neil Gaiman. Loved Neverwehere! Isn't it AMAZING!? I could go on forever about how amazing it is. Loved Stardust as well, it'a very close second. Good luck! I'm a long time fan of Neil Gaiman. I also love to listen to his audiobooks. I'm ashamed to say that I've never listened to his audiobooks *lowers head in shame*. But I definitely will! Good luck and thank you for entering =). 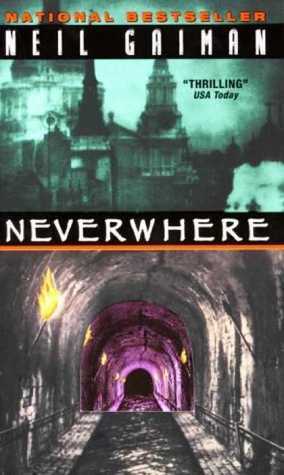 I've heard of Neverwhere, but haven't read it yet..:( His books look cool. neil has a different style from anyone else that I read. I always make sure to check out at least one per year, but of course at that rate it means he is producing them faster than I'm reading them! I have yet to read a book by him, but am excited to start! They sound amazing. Thanks for the giveaway!